It’s sort of depressing that the story of Rang De Basanti (“Color It Saffron“) still resonates nine years after its release. The movie’s calls for change remain largely unrealized, a testament to the power of the stagnation it rails against. Rang De Basanti connects the present to the past through the efforts of a British documentary filmmaker, Sue McKinley (Alice Patten). She arrives in India hoping to film a recreation of the Indian independence movement of the 1920s-30s, inspired by the regret-filled diary entries of her grandfather, a jailer and torturer on behalf of the Empire. Sue’s local contact, Sonia (Soha Ali Khan), introduces the filmmaker to her university friends, who reluctantly agree to participate in the project. Group leader DJ (Aamir Khan), sullen rich kid Karan (Siddharth), poet Aslam (Kunal Kapoor), and tag-along Sukhi (Sharman Joshi) slowly find themselves maturing as they inhabit the roles of their revolutionary forefathers. Further change is thrust upon them when another pivotal role in the reenactment is filled by Laxman (Atul Kulkarni), a Hindu nationalist who has a particular problem with Muslims. His integration is uneasy, especially since his role requires him to work closely with Aslam, a Muslim. When a tragedy hits close to home, the guys realize that the work of the independence movement won’t be complete until Indian democracy is transparent and devoid of corruption. They take matters into their own hands, adopting the violent methods of their forefathers. Although Khan is the highest profile star in the cast, his role isn’t necessarily the most important. This is truly an ensemble picture, with every role fleshed out. Every member of the group — including Sonia — has a reason to participate in Sue’s project. They each require a kind of character growth best developed by delving into history. Sepia-toned scenes from Sue’s documentary are woven into scenes from the present, showing the way that the lives of these contemporary young people parallel the lives of young people of the past. It’s a theme that resonates beyond the borders of India. Every democracy is founded on a struggle that modern citizens too often ignore, resulting in a failure to meet founding ideals. We can all do better. 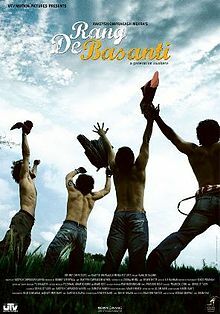 It’s unfortunate that the poster for Rang De Basanti features only Khan, Siddharth, Kapoor, and Joshi, because every performance in the film is superb. Kulkarni portrays a difficult character with great empathy. Patten and Soha Ali Khan are resolute, their characters developing along with the young men. R. Madhavan is great in a supporting role as Sonia’s boyfriend. Siddharth’s role is the meatiest, with Karan dropping his jaded act as the truth starts to torment him. Kapoor imbues Aslam with stoicism, and Joshi plays a great toady. Even though it’s not a solo starring role, this is among Khan’s best performances. A highlight is a scene in which DJ confesses to Sue that he actually graduated from college five years ago, but fear of the future keeps him hanging around campus with his buddies. The scene serves the dual purpose of explaining why DJ looks so much older than the others. (Khan was already 41 when the film released, not that this would be his last time playing a college student). Where Rang De Basanti falters is in its overuse of news footage in the final thirty minutes. It’s tricky, because the guys take drastic measures in order to inspire fellow citizens to action. But frequent shots of news broadcasts and opinion pieces slow down the narrative. Every random college student who vows to reform Indian democracy in a man-on-the-street interview distances the audience from the main characters. It interrupts the flow of emotions just when they should reach their peak. That said, Rang De Basanti is a surefire tearjerker. It’s a sad reminder that no nation is as free or equal as it could be, but it’s an important message. The work may be hard, and it may be ongoing, but it is work worth doing, just as it was so long ago. This entry was posted in Reviews and tagged 2006, 3.5 Stars, Aamir Khan, Alice Patten, Atul Kulkarni, Bollywood, Hindi, Indian, Kunal Kapoor, Movie Review, R. Madhavan, Rang De Basanti, Sharman Joshi, Siddharth, Soha Ali Khan on June 26, 2015 by Kathy. Finally you see this, the movie that I tout as being one of THE best modern Indian films of… ever! Also, if memory serves, RDB was a huge box office hit, releasing early 2006, after the industry went through a bit of a slump for a few years prior to. I know you`re not a fan of the man-on-the-street interviews, but this movie kind of started that in Bollywood, and can be blamed for why the technique is so over used. Given the public repercussions of their actions within the story, I thought it was probably the only time that this storytelling device was justified. Yeah, I struggle with my feelings about the end of the film, Shah. I like the reporters outside of the building commenting on what they are seeing, but I can’t stand the random students being interviewed. Whenever stuff happens at a college here in the States, it’s not like local news crews in every city turn to students for their opinions. I mean, who cares? It just seems so unrealistic. I’ve not seen this one and have been tempted to buy the DVD many times. Thanks for the inspiring review. One of my all-time favorites for all the reasons you stated. A powerful statement. It takes courage to dish out a movie of this kind, especially in an era when money, and not content, is King. I love the film so much. The film is too realistic. I was in school when the film came out. It made such a huge impact on Indians. The film became a movement at that time. Because of the impact, a high profile murder case was reopened and they finally got justice. Also, the film inspired the candle light protests which took place at India Gate when 2012 Delhi case happened. Most of the Indian news channels behave like that. Those news footage are spot on. Life imitating art. Neat, Gaurav! That is disappointing about the news reports, though. Have you seen Amitabh’s 1980s movies inquilab (revolution) and main azad hoon (i am free; azad is a Double entendre (lieral meaning free and is also name of ABs character in the movie.) ? You can watch it on youtube with english subtitles (links below). I will be curious to know your views on these 2 movies. Thanks for providing the links, Nav. I haven’t seen either movie. I will be eager to know your views. Inquilab starts like a run of the mill movie before it turns around. Besides its story and acting.. A R Rehman’s music in the movie was superb and on of his best. Such a handsomely written review, especially the ending lines. This movie was and still is one of my favorite Hindi movies. My favorite scene in particular was when during the climax, the gang walks in slo-mo before entering the radio station, the scene alternating between the past and the present with the grandfather’s voice in the background. Thank you for reminding me about how much I loved this movie. Greatest Indian movie ever. Period.